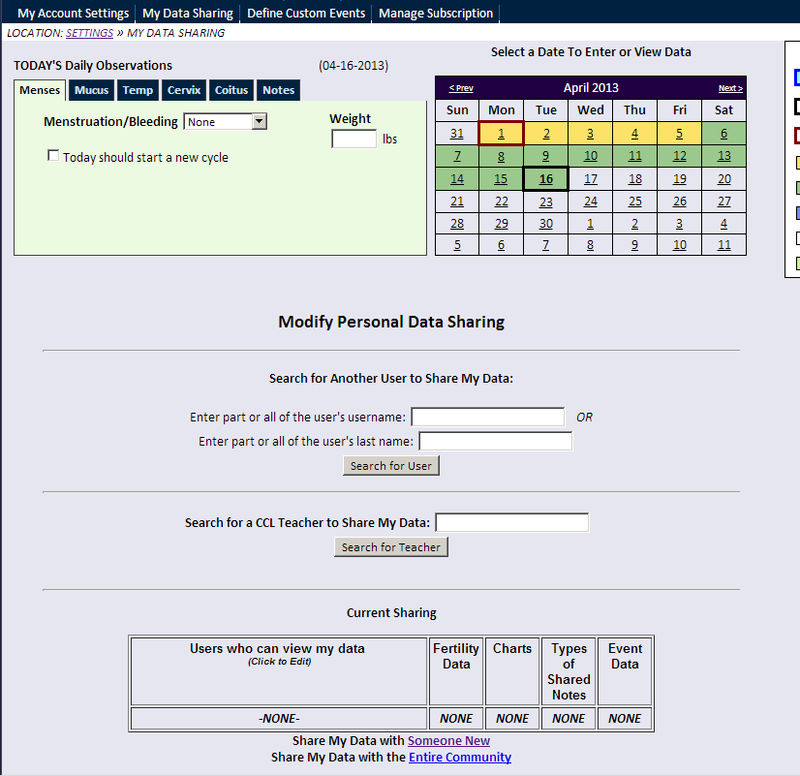 CycleProGo is the new online and app based charting program from Couple to Couple League International (CCLI.) This is an updated version of the charting software called CyclePro, and it offers some new features and of course the ability to use it online and via a mobile device. This application is based on the Sympto-thermal rules developed and taught by the Couple to Couple League. I will say right up front that I do work for (Volunteer) CCLI as part of a teaching couple, so as a teaching couple the app costs me nothing other than my time as a volunteer teacher. However, I do hope to offer an honest and fair review of this application. I can’t say this strongly enough. I don’t care what method you use, or what application you like, If you are going to use NFP in any form be that a app like this one, or just basic Charting, please, please, please take a course or at least get the books from a course. If Money is the problem (because some of the courses are expensive) there are free courses out there, and they are pretty darn good. Reach out to a teaching couple or provider in your area they might be able to help you find resources that will help you. It is worth your time to take a course. If you don’t NFP probably won’t work for you as well as you had hoped. As I noted the app costs me nothing. And you can download it from the Itunes store, or Amazon for your Android Device for free. While It is free to download and get a look at, you can’t actually do anything without paying for it. The price is pretty high at $5 a month or $12 a year. I will refer you to their site as to what you can do with the paid verses the free version I think the app would be much more accessible if the price were not to steep. One of the best things about this app is the ability to share with other devices. My wife uses a kindle, I have an iPod touch, and we both are in front of a computer quite a bit. For me having the most accurate and up to date information is the key to his application working at all. And I really like being able to check or enter the temperature or whatever else from where ever I am at the moment. Once inside the app it does offer you a lot of very nice features. If you are a CCLI member or have ever taken one of these courses much of the charts that you are used to seeing will be presented right up front for you. Entering your data is very easy and straight forward. I have an ipod touch Gen 3 and I do seem to sit at this opening screen for a long time. I Don’t know if it is trying to sync or just that my device is a little old and slow. I do like that the first screen after the loading screen gives you a daily tip, shows off new features and just give yous general information about the application. Most of of this information is available in the help screen, but who ever reads those right? It also gives you a place to give feed back about the application. 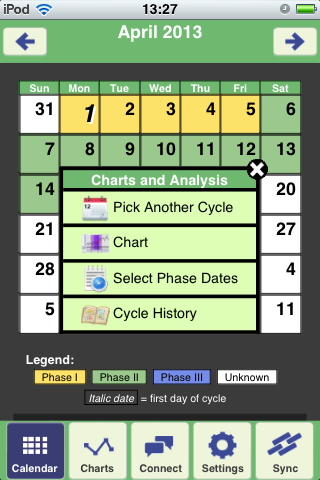 Once in the app itself, you are presented with the current month, that gives you a quick view of where you are in the cycle with color coding at the bottom to tell you what phase you are in. Click on or touching any of the days including the current one will allow you to enter or update your information for that day. 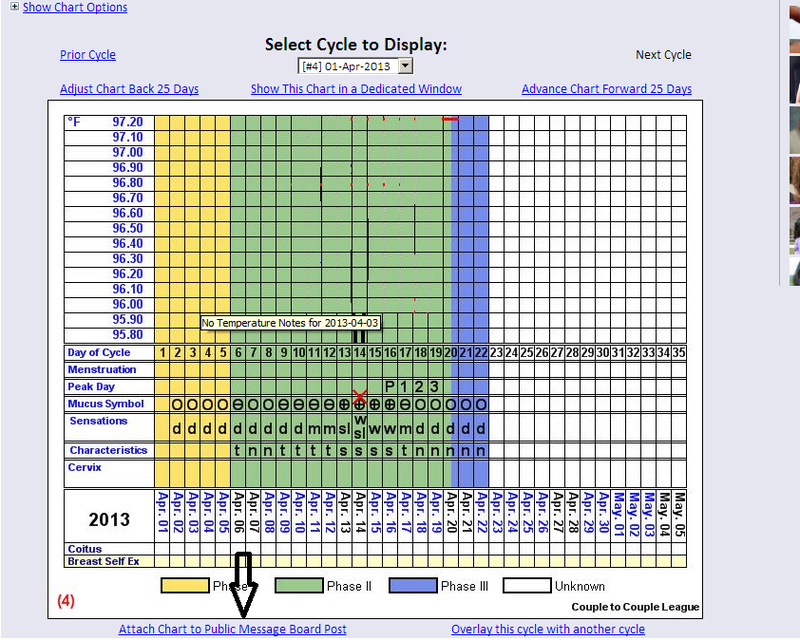 Choosing the Charts button at the bottom of the screen brings up a menu that allows you choose your current chart to add information to, choose another chart to review, change your phase date based on the rules you want to follow, or look at a general overview of your cycle history. I have to say that the ability to change your phase based on other rules is probably one of the best features of this app over other ones that I have used, especially since CCLI does teach multiple rules that you can use based on your needs. Clicking on the connect option at the bottom of the screen probably one of the biggest disappointments with CycleProGo in general. First in the mobile app, the connect button brings you to the screen below, which is not all that helpful. Updated As is the nature of software, there has been an update and they have made a change to one of the biggest problems I had with this app. As noted in the comments, there is now an option to share your charts with anyone via a URL that you can send to people. This is a huge improvement as far as I am concerned. This will generate a url you can send our chart to someone. However, let’s say you wanted to share your chart with your doctor, and they were not ccli members? There is a lot of information on this chart that a doctor can use to help you diagnose problems or even just help you determine a due date. In its current form there is no way to share that information with any one outside of CCLI beyond getting screen shots and e-mailing them. Just an example of this, our primary care physician is a Creighton method trained physician, she was interested in looking at my wife’s charts, and we were unable to send our charts to her, or allow her access to our charts so she could monitor the information through out the month without her becoming a member. The settings screens and the sync screen don’t have a lot to offer beyond what a standard app would have. 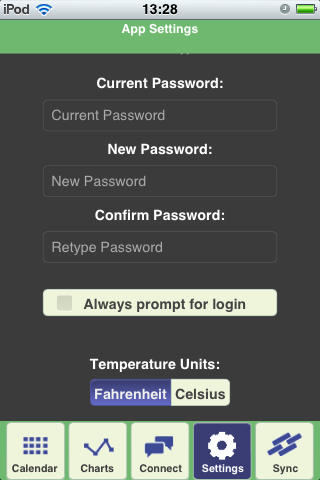 The Settings screen allows you to do things like change your password change from Fahrenheit to Celsius and how often to polls data from other sources. The settings screen also allows to add “events” to the list of things that you can note quickly on your charts. These are broken down into categories that include emotional, Physical, Medical, Pregnancy and custom. If you have ever tried to type a note about anything with a mobile device you know that having drop down lists of things that you use frequently is a good thing. Also being able to control the things on that list is good thing so that you are not scrolling forever. The Sync button does just that, it forces a sync with all other devices that you might be using. As I said at the beginning I give this App a 3.5 out of 5. I think that it has come a long way since the old cyclepro version, and it does have some pretty nice features. But I think there are some definite drawbacks, like not being able to share with people outside of CCLI. There are also seem to be some issues with the web based version and changing the rules you want to use. You are able to select some of the rules sets in the mobile version that although they are options in the web version they are not select-able. 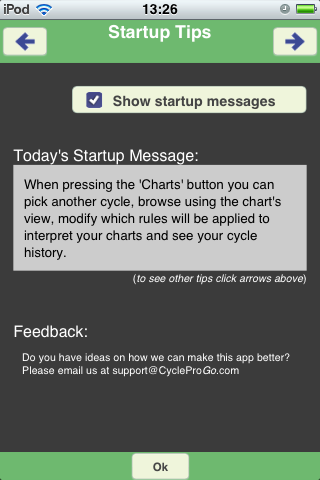 CycleProGo does allow you to share charts with anyone – including non-CCL members. 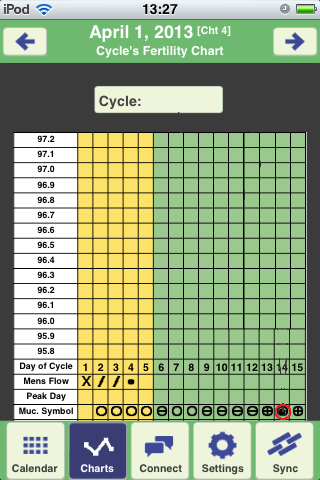 You have to log in to the CycleProGo.com website and then select “Fertility Charts” from the “Charting” menu. Just navigate to the chart you want to share, and then click on the “Attach Chart to Public Message Boards” link immediately beneath your chart graphic. It will then let you generate a URL that you can email to anyone to let them access your chart. This separate step is required to allow you to control when/if you decide to make your chart public for non-CCL members. The service does support what you were faulting it for lacking (albeit through the website presently and not the app). It may be useful to include a screen shot showing how to do this for others interested (I can’t seem to add one to my comment or I would to help you). I hope this makes sense! I personally like the app a lot. Thank you Brian, this must be a new because as recently as a few weeks ago when we talked with their tech support they told us that this was not possible, and our only option was to get screen shots and send them. Thanks for updating the review with the information. Since that was your primary fault with the site, I’m surprised it didn’t change your overall 3.5 star rating though. Your concluding paragraph still cites the eliminated deficiency as justification. It might be confusing for someone reading it for the first time. Just food for though. Personally, I’ve found CycleProGo and found it wanting. I guess it does what it’s designed for, but the security on it is pretty terrible (it usually only HTTP connections and stores/sends your password in plaintext as part of a cookie). I guess there’s no reason to be paranoid about fertility information, but on the flip side it is pretty personal information. On the flip side though, I’ve been writing my own app that my fiance (soon wife) and I are using. 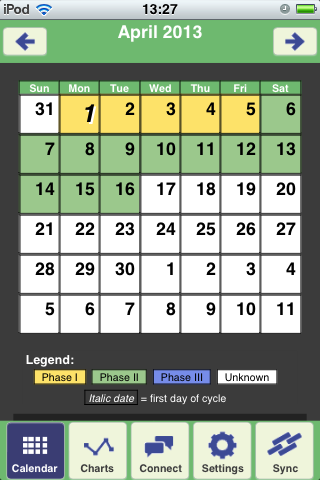 So one positive that I can say for CycleProGo is that they gave me a few ideas that I can steal at least (the coloring is pretty nice, although I would differentiate non-entered days from days where the phase isn’t sure). The security claim seemed bogus since the app is approved by Amazon and I know Amazon requires SSL for password transmission. I am logging into CycleProGo over a secure HTTPS connection too just fine (my browser shows https://cycleprogo.com:444/). I got curious so I checked with their support and entry directly through CycleProGo.com was recently changed to default to SSL encryption. Maybe you have older links you were using? I know the apps would have never gotten approved by the stores if what you said was true though.